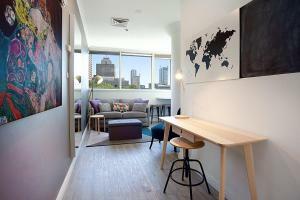 Central artistic 1 bed apartment with views is located in Sydney. This apartment also has free WiFi. 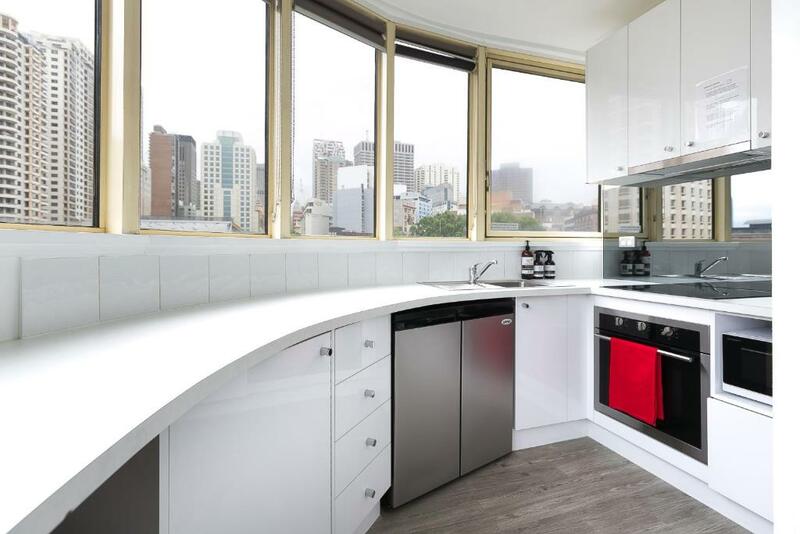 This apartment has a living room and a fully equipped kitchen with an oven and a microwave. A TV is available. Art Gallery of New South Wales is a 20-minute walk from the apartment, while Hyde Park Barracks Museum is 1.3 miles from the property. The nearest airport is Kingsford Smith Airport, 5 miles from the property. 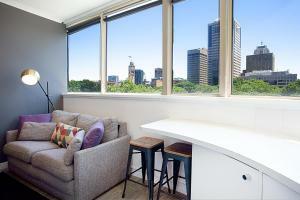 When would you like to stay at Central artistic 1 bed apartment with views? Innovatively designed and recently renovated 1 bed apartment artfully fit out and styled. Ideal for freelance creatives, executives or a travelling couple. Incredible views of Sydney’s urban canopy. Huge windows with natural light. 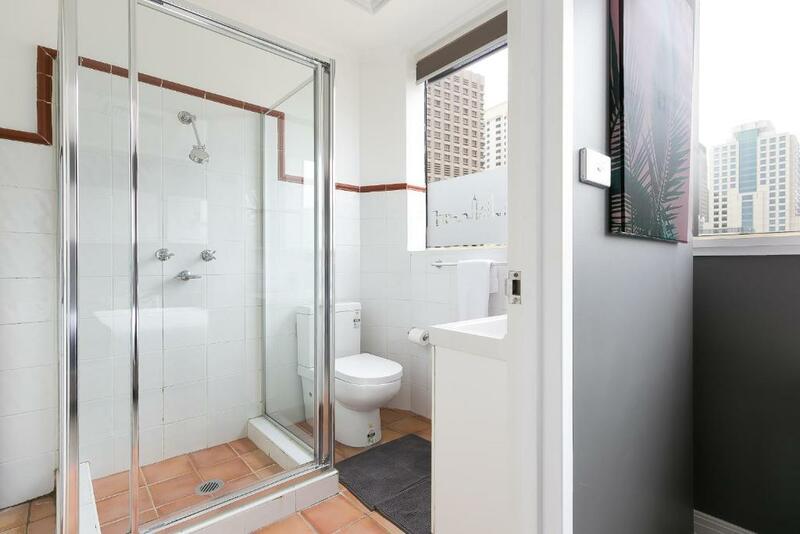 Stylish bedroom with scenic views and a large ensuite bathroom. 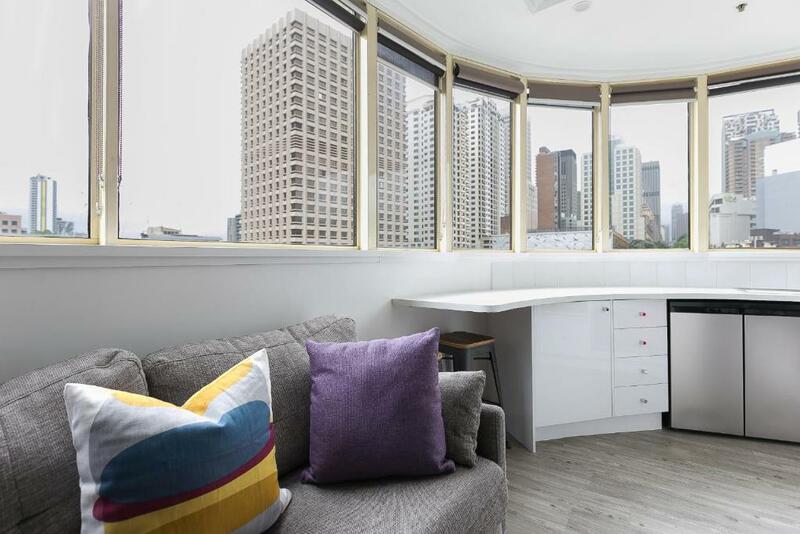 Beautifully styled living space that cleverly follows the buildings curvature. 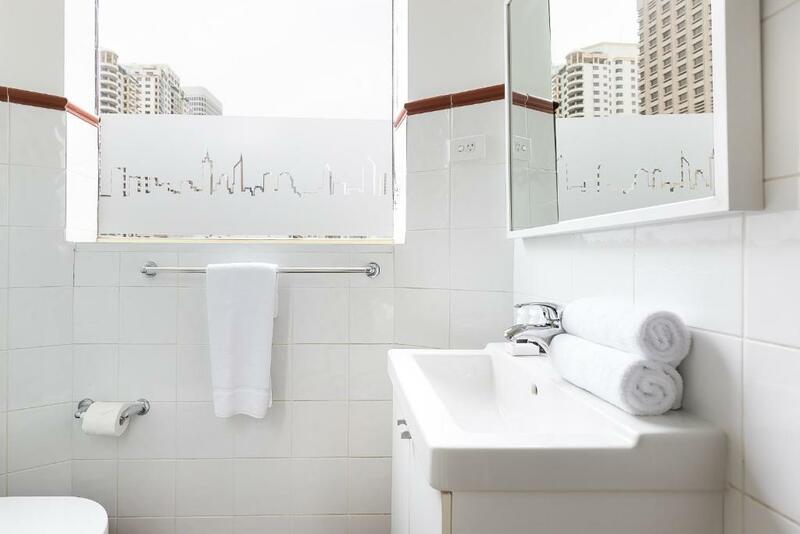 Just minutes’ walk from the centre of city, Central Station and right in the middle of Sydney’s trendiest dining district. 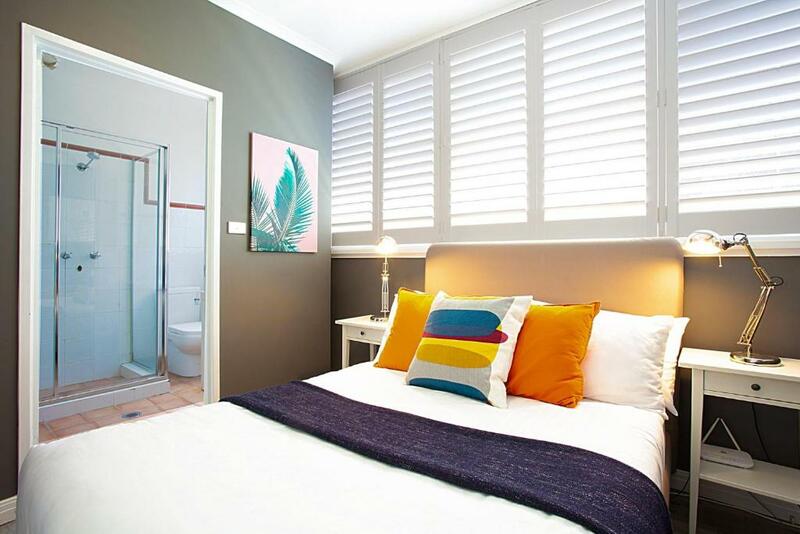 Surry Hills is where the rest of Sydney goes on the weekend if they’re not at the beach. Most go to eat or drink; the suburb has a genuine mix of Sydney’s most cutting-edge restaurants and bars as well as some old-fashioned neighbourhood gems. Everyone else is probably going to shop (both vintage and boutique), conversely, to wander into the area’s many art galleries. Some, will probably do all three. 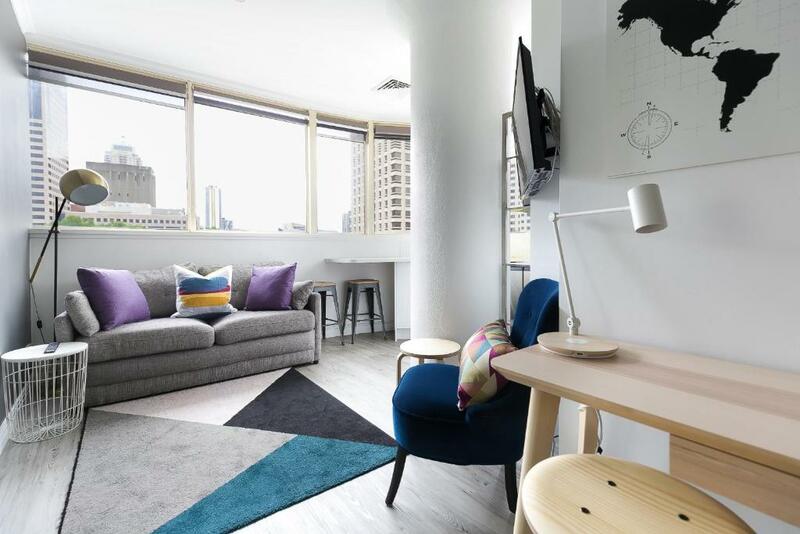 House Rules Central artistic 1 bed apartment with views takes special requests – add in the next step! Central artistic 1 bed apartment with views accepts these cards and reserves the right to temporarily hold an amount prior to arrival. Sofa Bed mattress was so uncomfortable, my son had the worst sleep👎🏻 No parking on property and NOT clearly stated, it cost me a fortune for parking I couldn’t afford👎🏻 Very dusty around skirting boards & generally tiny....... not worth what I paid at all. I have stayed in far superior properties for less and they had parking facilities. Listing is misleading. And, I still haven’t seen receipt of my deposit which if I don’t see soon I’ll have to escalate a claim against the property. The property owner informed us a few days before we arrived Sydney that the key can be collected at SmarteCarte at Sydney International Airport. It was a very last minute notice (we have arrived at the airport) when we were being informed that the owner will pass the key in front of the apartment instead. Next, the iron wasn't functioning and we asked the owner to replace it with new one as soon as possible. He said he would send it on the same day around 8 pm but we ended up received it on the next day in the evening when we only have one night left before we check out. The house is very clean and nice. The location is strategic where it only takes us 5 to 6 minutes to walk to North Concourse, Central Station and 8 to 10 minutes walk to Coles World Square in order to buy groceries. The kitchen utensils are complete and in fact, this is the first apartment I have booked so far that provide rice cooker. The view from apartment is great and we can easily find the apartment by using Google Maps. Love everything about this house!